If you need to rent both houses you must make reservation for each independently , using the Booking Calendar in each case. If you prefer, you can contact us to formalize your reservation. Call any of the following numbers: 00 34 985 882 757 / 00 34 619 882 757 or send an email to info@casaspradina.com. We will be happy to assist you! in Pradina I and book now! The time to entry into the house will be from 17.00 hours. Check out must be done before 12.00 hours. You can book by phone : + 34 985 882 757 / +34 619 882 757 or via E-mail: info@casaspradina.com, to enforce your booking we will ask for 30% of total amount to be paid by bank transfer. Once received you will be sent a booking confirmation. The remaining amount will be paid in cash at the time entering the house. 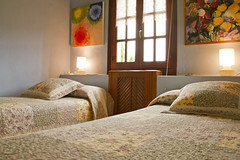 If the house is available may be occupied until 16.00 hours at an additional cost of 20,00€ (inquire in advance). Ability out until 20.00 hours at an additional cost of 50,00 € (inquire in advance). No pets. Conditions of cancellation: If takes place with more than 15 days with regard to the date of entry, the total amount of the money paid in advanced will be refounded; if it takes place between 15 and 7 days before the date of entry, there will be a 50% money back and if it takes place within 7 days previous to the entry in the house, no amount will be returned. 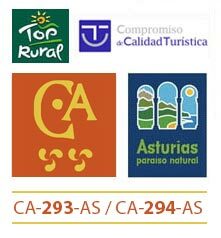 (Order 143/2002 November the 14th, of the Principado de Asturias Rural Tourism Accommodation). Where appropriate, the bank amounts of commission and processing fees will be deducted. The tenants have to take responsibility of the damages that they cause to the facilities and the furniture. Daily cleaning is not included in the price, so it is necessary to reserve the service in advance in case the tenants wish. Heating off season : 2 €/hour. typical heating season from October to April (inclusive). The rates of special offers and discounts are applied when booking directly with the establishment and payment is needed to be in cash. (Special offers are not binding to other offers that could be published, in this one or in other websites referring to Rural Accommodation Pradina). 11364289N Valley Ren s/n, Cardo (Gozón), Luanco.